Unbelievable that Lee Konitz was 89 before he recorded for Impulse. Unbelievable that a musician who was a contemporary of Charlie Parker is still producing vital music. Konitz has travelled a long line, stretching back to Lennie Tristano, then the time when he battled with Stan Kenton’s brass for two years, the exquisite duets with Warne Marsh and the ground breaking album with Elvin Jones to the years when he has travelled the continents playing with pick-up rhythm sections. One of the mysteries of jazz is why this great figure who espouses everything that jazz is supposed to be about has been so under-appreciated. The urge to improvise is what has driven this great player through his long life. 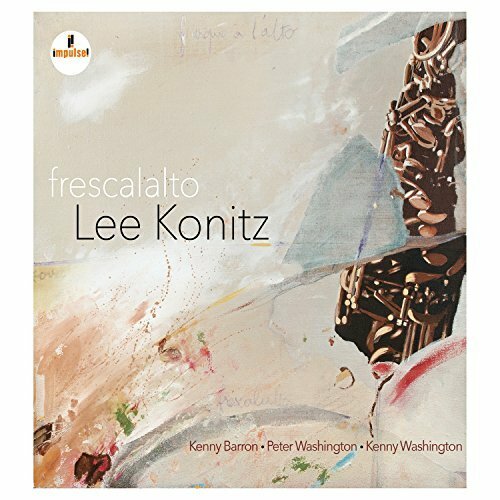 Konitz 2015 is very different from Konitz in 1940 when he made his first records. He loves the challenge of playing a song that he played hundreds of time across the world and yet making it new each time. There is a strange lucidity about the lines he produces. Now, he sounds wayward as he weaves a very personal path through each song. You stay with him because you trust him, you realise he knows where he is going. There is an addition on this record: Lee Konitz sings! Admittedly his singing is like Ornette Coleman’s violin playing; an acquired taste. It is only on a couple of tracks! Pianist Kenny Barron was valued by the severe task master Stan Getz and here he works well with Konitz. The change of tempo in Cherokee where his musical dexterity shows is joyful. The Washingtons, Peter (bass) and Kenny (drums), no relation, underpin every piece on the album with dynamic taste and fluidity. The recording is spacious and captures the unique timbre of the Konitz alto. My favourite track is Cherokee which Konitz starts at a sly tangent from the song and makes you think that he is lost, forgotten where he is. Not so! He knows exactly. You could say there is nothing novel here. Almost right, Konitz playing his favourite themes with piano, bass and drums is not new. And yet everything is new.